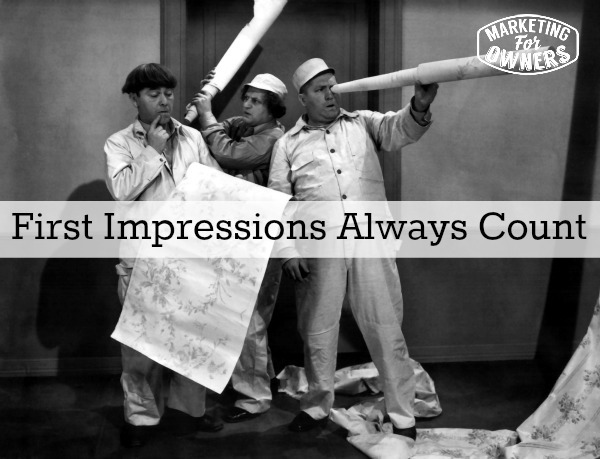 Today we are talking about first impressions and these are always, always going to count. You only get one chance. I’ve said it before — how can you make sure your first impression is a good one? For your business and your brand, have you told everyone else about this? So what first impression do they give? For example — when I used to go through London on the train, they have a lovely wine bar in there. However, it was really annoying how their system works. You would have to go and find a table, choose your number, go and queue up at a bar, order your drink, and then go and sit down. Meanwhile if you are on your own, you had no idea that someone had already gotten that number, and then you go back and someone is sitting there, or with their friend who has just come in. Then you say, “Oh excuse me, that’s my table.” So my first impression of that place is how annoying their system is. And the funny thing is this — everything else about them is great, but every single time I ride this train, that is the first thing I think about. If it is going to be annoying to the customer, why would they do that? Unfortunately, there isn’t any alternative, so I still have to go there. Recently when I went, I noticed that they have changed things a bit. Now the food and drink is brought out by waiters and servers. They have moved to a more traditional service and it is fabulous. I actually thanked them for making the change and gave them a bigger tip because of it. I’ve been into restaurants before and I will compare them to the best recent experience that I have had. Some of them seem to have no clue or no idea on how to greet at the door of a restaurant. I don’t need to be loved on when I walk in, but I just need to be greeted when I enter the restaurant. One of the things that bother me is when there are tons of us waiting to be seated and no one comes around to check on you while you wait. The first impression that is left with me is that they don’t particularly care about their customers. Now, I may be wrong and they may just be super busy, but it doesn’t matter. That is the thought or impression I am left with. My brain thinks this forever now, and that is the way it is with your service. If you are a plumber and you turn up to a job in scruffy or dirty outfit, the homeowner is going to think, “You’re coming in my nice clean home with all that dirt on you?” Now granted, you might have just left a job where you were dirty, but all your customer can see is the first impression of you bringing dirt into their home. Why not keep a spare pare of overalls or work uniform in your vehicle? Now, if you think, “Why should I bother? It’s just a bit of dirt”, understand that this is their house, and it is their impression of you that matters. You need to make it count so give the people the opinion you want them to have. If I told you that I am a Facebook marketing expert, most of you would assume, based on my words that I am what I say I am – a Facebook marketing expert. You wouldn’t go look it up on Google, you would just take me at my word — that is my impression. Please note that I am NOT a Facebook Marketing Expert in any way form or fashion. I was just using this as an example. You must be able to back up what you promise. So – if you are that plumber, check out the way you look and change clothes if necessary. You might even need to carry around 5 changes of clothes. By taking note of how you look, you are setting the right first impression as a plumber. When your client opens the door, she is going to be happy to see that you are not like every other plumber out there. When she needs another one, who do you think she is going to call? You my friendly Owner! You are giving the impression you want. You are looking professional — it doesn’t matter if you are a good plumber or a mediocre plumber who only has half the right tools needed for the job. What matters is the impression you are leaving this customer. Same with automobile companies like BMW and Mercedes. They give you the impression of the company that they want you to have. If you ask what is the difference between a Mercedes and a Volkswagen, the company will tell you that Mercedes are more expensive and have more bells and whistles. The impression that this leaves you is that Mercedes is a more luxurious car. They have made you have that thought. Since we are talking about cars — how do you know the difference between the regular and the luxury brands? Do they leave off nuts and bolts on the regular and add rusty parts based on the luxury model? No — they tell you that the luxury model is better and you gravitate towards it more. The reason for this is because the car brand has given you the first impression of what they want you to see. As long as they back up what they are saying, you are going to say that this is great. It’s Thursday and time for a drive time podcast. Today is my Australian mate James Schramko. 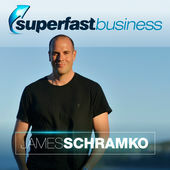 James hosts the podcast Super Fast Business. He is a lovely bloke. He records more than one podcast, but the one we are talking about today is his main one. If you have ever wanted to know how to become an internet marketer, James is one of the very very best out there. Of all the Internet marketers out there, he is one of the most genuine and honest. He practices what he preaches. He had a very substantial business planning right off the kitchen table with his wife. Check him out and then visit his website and listen to his podcast and be sure and give a rating. What kind of first impression are you leaving?